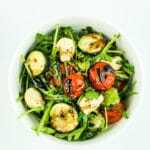 This grilled zucchini caprese salad recipe is a mixture of summer’s best flavors – grilled zucchini and tomatoes tossed with arugula, basil, mozzarella, and balsamic glaze. Preheat grill to medium high and spritz with olive oil or cooking spray. Make your kabobs! Skewer zucchini and tomatoes and place onto the hot grill. Cook 8-10 minutes, rotating halfway. In a large bowl, combine arugula, mozzarella, fresh basil, zucchini, tomatoes, salt and pepper. Toss and then add cooled balsamic reduction, then give it another toss. Seal it up and place in the refrigerator for 10 minutes. In a small saucepan, combine balsamic vinegar and maple syrup. Stir to combine. Cook over medium-high heat until it starts to bubble. Decrease heat to medium-low and simmer for 8-10 minutes. Remove from heat and allow to cool. You can make this salad without the balsamic reduction – just use your favorite balsamic vinaigrette instead!